Thai police have released a detailed sketch of the man suspected of planting the bomb. 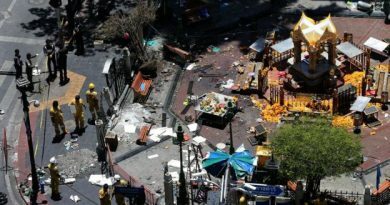 The bomb attack that killed 20 people at Bangkok’s Erawan shrine on Monday was carried out by a “network”, Thailand’s chief of police has said. Police have released a sketch of the main suspect, a man in a yellow T-shirt who was filmed by security cameras leaving a backpack at the shrine. The Hindu shrine, popular with tourists and Buddhists, reopened on Wednesday. Prime Minister Prayuth Chan-ocha has described the incident as the worst-ever attack on Thailand. 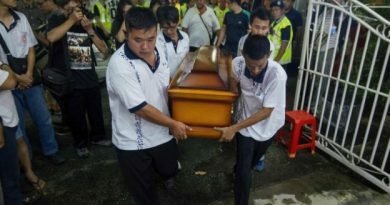 Thai police chief Somyot Poompanmoung told the Associated Press news agency on Wednesday that the shrine attack was the work of more than one person. “He didn’t do it alone for sure,” he said, referring to the main suspect. “It’s a network,” he added, without giving further information. He said he was certain that Thai citizens were involved in the bombing, but could not confirm if the bomber was a foreigner or a Thai citizen in disguise. Mr Prayuth told reporters the man must have been hired to plant the bomb. The shrine reopened at about 08:00 local time (01:00 GMT), with a handful of people arriving to place flowers or light incense in front of the slightly damaged statue of the Hindu god Brahma. A BBC reporter at the scene says there appears to be low security in place, with the public free to walk in unchecked. She says the last human remains were only cleared from the site earlier on Wednesday. In a separate attack on Tuesday, an explosive device was thrown at a pier in Bangkok. No-one was hurt, but the authorities have not ruled out a link between the incidents. Maj Gen Weerachoon Sukhontapatipak, a spokesman in the military government, earlier told the BBC that the authorities were “quite close” to identifying the suspect caught on CCTV at the shrine. The man is seen carefully removing his backpack inside the shrine – at the spot the bomb went off – then getting up without it and immediately leaving. Maj Gen Sukhontapatipak said no motive was being ruled out, but that the bomber did not appear to be Thai and the character of the bombing was “quite different” from previous bombings by Islamist separatists in southern Thailand. 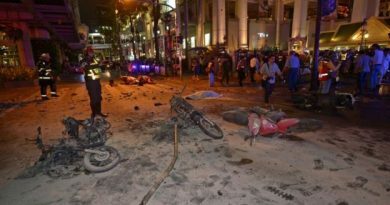 Speaking in a television address on Tuesday evening, Mr Prayuth said the attack showed that Thailand “still has a person or a group of people with hostility to the nation operating actively”. “They may be doing it for a political motive or to undermine the economy or tourism or for other reasons,” he said, according to the Bangkok Post. He also warned against speculation on possible perpetrators, saying it could cause panic or mislead the investigation.